The Camp Dodge staff has now completed its last week of training and the first of the volunteer crews are underway. Last week was a busy week for the Dodge Staff as the final preparations were made; cleaning the camp, testing the gear, and checking the tools. The first of the volunteer crews arrived Sunday evening and left for work on Monday morning. Two of the crews are spike crews which are base camping at their work site while one of the crews is staying at Camp Dodge. Both of the spike crews are building bog bridges, on Twinway and Wildcat River Trail respectively. 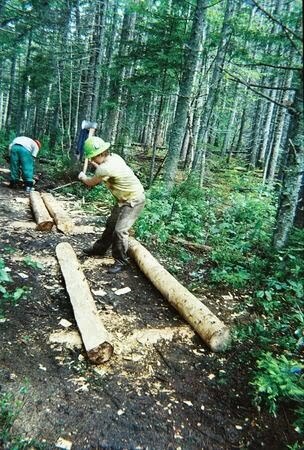 The crew that is staying at Dodge is doing rock work on the Great Gulf trail. So far the week has gotten off to a great start as the crews quarry rocks, fell trees, and begin their projects.